There are three basic types of hand-operated valves used in aircraft fuel systems. The cone-type valve and the poppet type valve are commonly used in light general aviation aircraft as fuel selector valves. Gate valves are used on transport category aircraft as shutoff valves. While many are motor operated, there are several applications in which gate valves are hand operated. A cone valve, also called a plug valve, consists of a machined valve housing into which a rotatable brass or nylon cone is set. The cone is manually rotated by the pilot with an attached handle. Passageways are machined through the cone so that, as it is rotated, fuel can flow from the selected source to the engine. This occurs when the passageway aligns with the desired fuel input port machined into the housing. 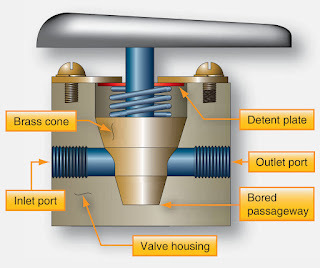 Figure 1 shows a cross sectional view of a cone valve. The cone can also be rotated to a position so that the passageway(s) does not align with any fuel input port. This is the fuel OFF position of the valve. A cone valve is open when the bored cone aligns the inlet and the outlet ports. Selector valves are also commonly the poppet type. As the handle is rotated in this valve, a cam on the attached shaft lifts the poppet off the seat of the desired port being selected. At the same time, spring-assisted poppets close off the ports that are not selected. Detents lock the valve into position when the cam pushes a poppet fully off of its seat. There is also a positive detent when the cam engages none of the poppets, which is the OFF position of the valve. 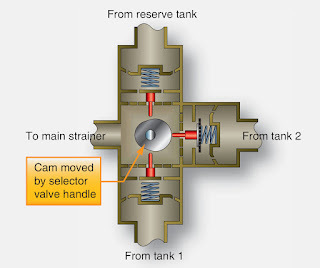 [Figure 2] Note that a similar mechanism is use in some selector valves, but balls are used instead of poppets. 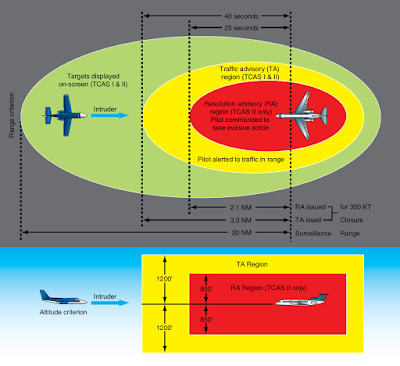 A single selector valve is not used in complex fuel systems of transport category aircraft. Fuel flow is controlled with a series of ON/OFF, or shutoff, type valves that are plumbed between system components. Hand-operated gate valves can be used, especially as fire control valves, requiring no electrical power to shutoff fuel flow when the emergency fire handle is pulled. The valves are typically positioned in the fuel feed line to each engine. Hand-operated gate valves are also featured as ground-operated defuel valves and boost pump isolation valves, which shut off the fuel to the inlet of the boost pump, allowing it to be changed without emptying the tank. Gate valves utilize a sealed gate or blade that slides into the path of the fuel, blocking its flow when closed. Figure 3 shows a typical hand-operated gate valve. 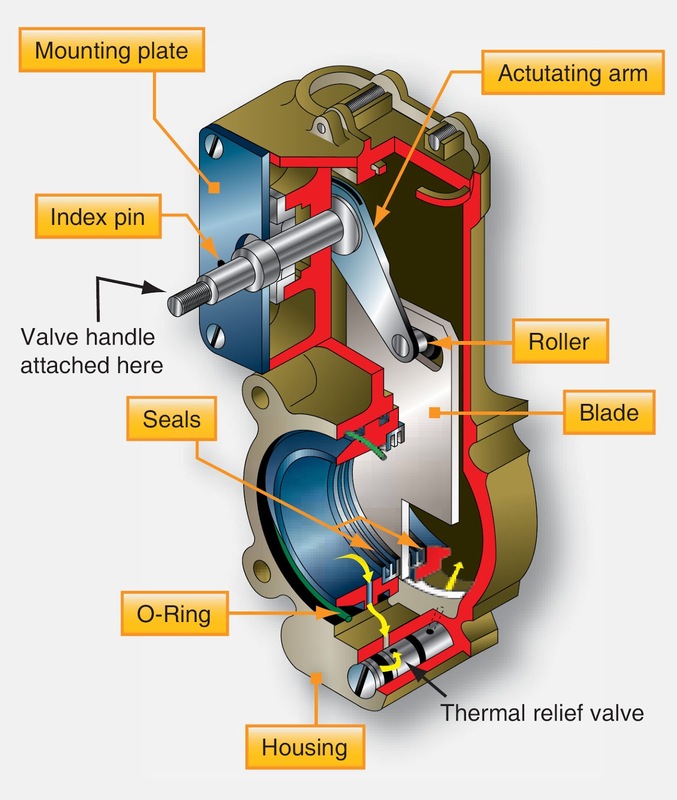 When the handle is rotated, the actuating arm inside the valve moves the gate blade down between seals and into the fuel flow path. A thermal relief bypass valve is incorporated to relieve excess pressure buildup against the closed gate due to temperature increases. 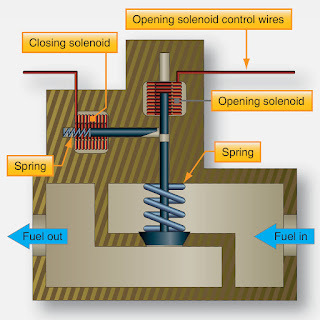 The use of electric motors to operate fuel system valves is common on large aircraft due to the remote location from the cockpit of fuel system components. The types of valves used are basically the same as the manually operated valves, but electric motors are used to actuate the units. The two most common electric motor operated fuel valves are the gate valve and the plug-type valve. 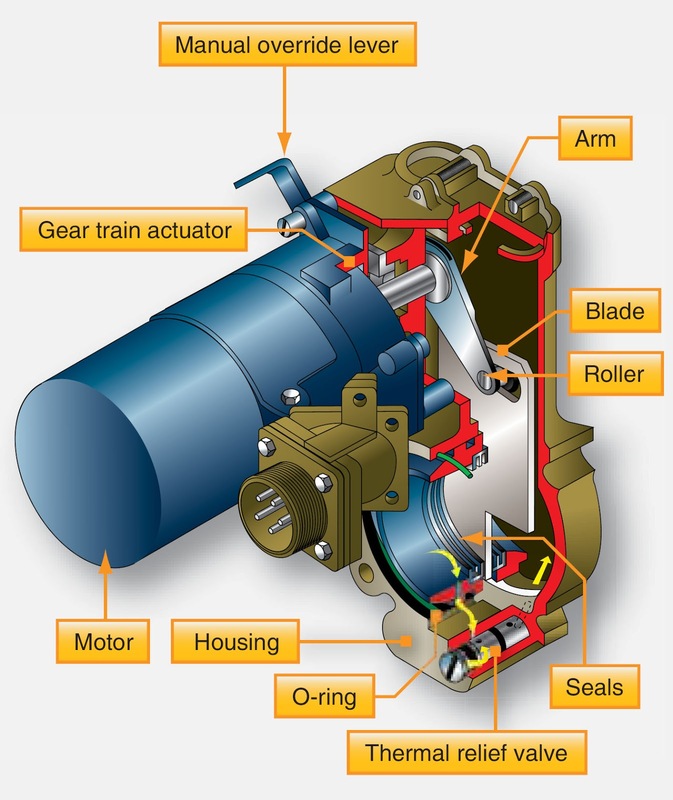 The motor-operated gate valve uses a geared, reversible electric motor to turn the actuating arm of the valve that moves the fuel gate into or out of the path of the fuel. As with the manually operated gate valve, the gate or blade is sealed. A manual override lever allows the technician to observe the position of the valve or manually position it. [Figure 4] Less common is the use of a motorized plug-type fuel valve; an electric motor is used to rotate the plug or drum rather than it being rotated manually. Regardless of the type of valve used, large aircraft fuel system valves either allow fuel to flow or shut off flow.